An ethereal glimpse of a fin or tail. Silence, then a gigantic form breaches the surface. 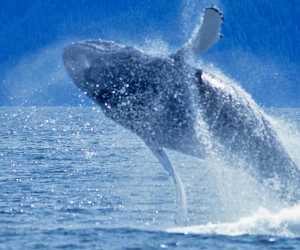 Countless whales spend the summer near Alaska shores feeding, and views of these mighty mammals are best in the waters near Anchorage. Resident beluga whales cruise offshore right where the city meets the water. These white whales are easily spotted as they surface in silty waters of Turnagain Arm. About the size of a car, belugas feed on hooligan and salmon runs returning to local rivers and streams. The best spots for beluga include turnouts alongside the Seward highway Bird Point and – of course – Beluga Point. Fin, minke, humpback, gray and orca whales are among the dozen species that ply the rich waters of Prince William Sound and the waters outside Resurrection Bay. Day cruises out of Seward and Whittier combine the opportunity to whale watch with views of puffins, sea lions, seals and glaciers.